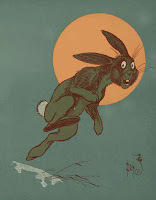 In our day and age children no longer believe in rabbits on the moon. 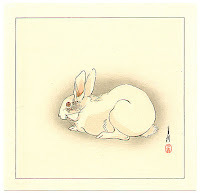 But all Japanese know the charming legend and still see in the shadows on the full moon a rabbit threshing his rice. 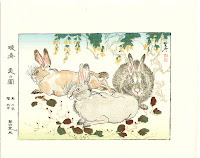 Once upon a time long ago, a monkey, a rabbit, and a fox lived together as friends. During the day they frolicked on the mountain; at night they went back to the forest. This went on for some years. The Lord of Heaven heard about it and wanted to see if it were really true. He went to them disguised as an old wanderer. "I have travelled through mountains and valleys and I am tired out. Could you give me something to eat? ", said he, laying down his staff in order to rest. The monkey went off at once to gather nuts that he presented; the fox brought an offering from his fish trap in the river. The rabbit ran through the fields in every direction but came back with nothing. The monkey and the fox made fun of him: "You are really good for nothing." 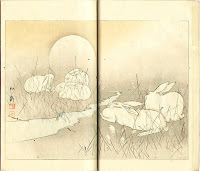 The little rabbit was so discouraged that he asked the monkey to gather some thistles and the fox to set fire to them. They did so. Then the little rabbit said to the old man, "Please eat me", and threw himself into the flames. The pilgrim was pierced to the heart by this sacrifice, and wept, saying, "Each one deserves praise; there are neither winners nor losers. 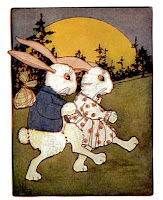 But the little rabbit has given an exceptional proof of love." After sending out my comment yesterday, I went to bed.I realized it's so coincident only after I came back home after work today.Thanks for the detailed explanation which let me know your carefulness.The content of your article this time makes me in Taiwan where we have same rabbit legend feel particularly warm.We celebrate moon festival in mid-Autumn,eating moon cakes and looking for the rabbit in the moon...giving ourself a reason for enjoyment. The moon in Taipei is not so clear tonight, but your illustrations in the text is still very brilliant ,thank you for sharing. i didn't know that the story was shared in taiwan--that's wonderful. the thing it makes me think of are russian tea cookies which are in the shape of crescent moons and are white with powdered sugar (and taste of heaven). almost no moon tonight at all. what a very lovely blog you have. I am fascinated by Japanese interpretations of peacocks. Do you run accross these much? thank you so much, maryam--and welcome! we've talked about peacocks several times (just use the searc blog on top) but i'll keep a lookout for you. thanks princess--i find myself wondering if such a tale would exist here in the west. 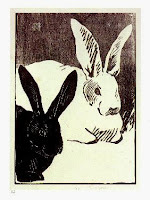 and also i wonder about how different the bunnies look!